NIUM Recruitment 2019 - Job notification for 41 Professor, Readers & Other Posts in NIUM, Bangalore, Karnataka. 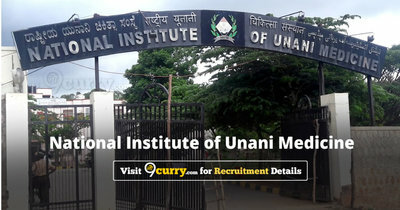 Applications are invited by National Institute of Unani Medicine on or before 22 Apr 2019 for 41 vacancies. 01 1) Degree in Unani Medicine with First Division from a University established by law or statutory Board/Faculty/Examining Body of Indian Medicine of equivalent and included in the II schedule of IMCC Act, 1970. 02 MBBS with M.D in Anaesthesia, Enrolment in the MCI Register. Persons holding analogous posts in Central Govt./State Govt./Hospitals/Autonomous Institutions. 01 Bachelor's Degree in Science from a recognized University with two years experience in Laboratory Technology in the relevant field in Laboratory of a recognized Hospital/Institution. 01 Two years Diploma in Electrical Engineering or equivalent qualification from a recognized State Board of Technical Education. 05 Intermediate or equivalent qualification with a speed of 30 wpm in English typewriting or 25 wpm in Hindi typewriting and proficiency in computers. 01 Certificate in Library Science. Knowledge of Urdu/Hindi/English. 01 1) Intermediate OR equivalent qualification from recognized Institution/ University/Board. 01 Matriculation OR equivalent examination with three years experience in dispensing medicine in a reputed Institution. Knowledge of Hindi/Urdu. (d) Marks sheet of M.D./M.S. of all the years. (e) Experience Certificate if any (if it is from a private college, the same should be got countersigned from the Registrar of concerned University, failure to which the application will be rejected summarily). (f) Enrolment on the Central Register of CCIM or State Register of ISM/ in the MCI Register. NIUM Recruitment 2019 - Job notification for 42 Professor, Reader & Other Posts in NIUM, Bangalore, Karnataka on Contract Basis. Applications are invited by National Institute of Unani Medicine on or before 22 Apr 2019 for 42 vacancies. CCIM Recruitment 2019 - Walk in for JTA & Jr. / STA Posts in CCIM, New Delhi on Contract Basis. Candidates are invited by Central Council of Indian Medicine to attend walk-in-interview to be held on 24 Apr 2019 11:00 AM for 3 vacancies.